Ten Eleven Ventures, the first exclusively cyber-focused venture firm, is pleased to announce the close of our $200M TEV II Fund. The TEV II Fund will employ the same successful, focused strategy pursued by the TEV I Fund: leading Series A and B rounds in industry-changing cybersecurity companies while providing industry insider advice to founders. We will build on the track record of successful TEV I investments such as CyberGRX, Cylance, Digital Shadows, Hexadite, Jask, Twistlock and Verodin. 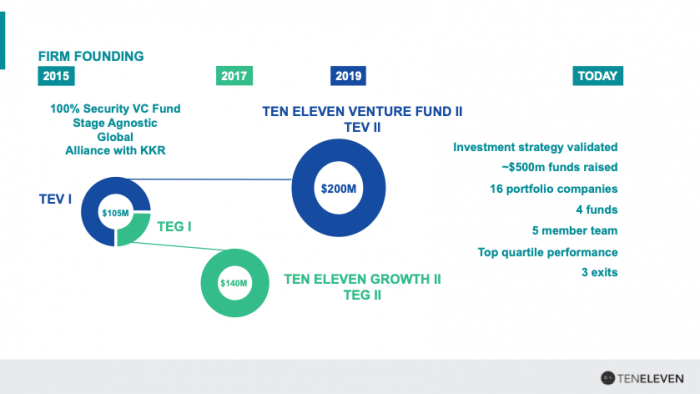 In just four years, Ten Eleven Ventures now has ~$500M in assets under management between the newly closed TEV II Fund, TEG II Fund (a $140M growth-focused fund closed August 2018), and the fully-invested, top-performing TEV I and TEG I Funds (focused on venture and growth respectively, 2015 vintage). We remain committed to our principal differentiators, being sector-focused and stage-agnostic. Additionally, four years after the launch of our first funds, we’ve grown our team to support the firm’s expansion, bringing on the complementary expertise of our new EIR Paul Ayers and new Associate Kaiti Delaney (more detail on their backgrounds may be found below). With new capital and an expanded team in place, Ten Eleven Ventures is ready to ignite and nurture the next generation of cybersecurity companies across the globe. We look forward to the work ahead, confident in the expert firm we have built and our unparalleled ability to source, assess, and help grow innovative cybersecurity companies that protect the digital assets and infrastructures of organizations and countries worldwide. When Mark Hatfield and I first launched Ten Eleven Ventures in 2015, we heard some skepticism from those who wondered if there was a need for a dedicated cybersecurity investment firm. Conventional wisdom dictated that the sector was amply funded and advised by the dominant, name-brand funds who had made successful investments in the space. Mark and I had a contrary point of view, informed by our decades of experience founding and operating cybersecurity companies. The needs of highly technical, sometimes quirky cybersecurity founders were unique. Finding the right path to growth required specialized knowledge of the competitive landscape and corporate gatekeepers. We believed we could use our personal experiences and close network in the cybersecurity universe to help entrepreneurs better build and grow their businesses. Additionally, while cybersecurity had historically been a successful niche for some name brand venture capital funds, an unintended consequence of their own success in raising larger fund sizes (frequently $1b+) was an accidental abandonment of early-stage venture investing. Ever the entrepreneurial industry itself, many new forms of capital came in to fill the void (pre-seed, seed, SAIFEs, bridges, piers) – but these are forms of financial innovation, rather than sector-specific knowledge or experience. We further suspected a firm with not only highly specific sector expertise but also the ability to nimbly invest at different stages of a company’s growth cycle would be at an advantage versus smart but generalist, stage-specific capital. Thus, we saw an opportunity to add “value beyond capital,” armed with practical experience regarding the vital components of building a cybersecurity business (in addition to just developing “magic bits”). From our earliest interactions with founders, we found this hypothesis had legs: entrepreneurs genuinely appreciated investors who could not only talk their language but also truly understood the twists and turns of their imminent journey. Furthermore, they could truly leverage our technical insights and hard-earned lessons. It took us a little longer to appreciate the competitive advantage of being stage- agnostic, but its benefits have been no less striking. From the beginning, Ten Eleven has been a stage-agnostic firm, pursuing early and growth-stage investments out of our separate venture (TEV) and growth (TEG) funds. However, it wasn’t until our first handful of growth deals (conducted through our joint investment alliance with KKR) that we fully realized the benefit this attribute afforded us. We had not only a more comprehensive perspective of the cybersecurity landscape but also were able to deliver value-added insights to founders at all stages of a company’s growth cycle. This led to successful growth investments in Darktrace, Ionic Security, Ping Identity, and Optiv. We are proud that our vintage 2015 funds, TEV I and TEG I, are both top quartile performers against the Cambridge Associates benchmark. Through these funds, we have invested in 16 companies to date. (At the end of last year, we completed our final new name investment from TEV I with the Series A backing of Sonrai Security.) Currently, we have active portfolio companies in California, Massachusetts, Washington D.C., Colorado, Georgia, Texas, and Oregon, as well as internationally in the United Kingdom and Israel. We have already had three realized gains, with (i) Ping Identity, a leader in identity defined security, selling to Vista Equity Partners in 2016; (ii) Hexadite, an Israeli-based early player in the security orchestration and automation market, selling to Microsoft in 2017 and (iii) the recently announced and pending acquisition of Cylance, the pioneer of endpoint cybersecurity and AI for $1.5 billion by BlackBerry. While it was famously and quite correctly predicted that “software [has] eaten the world ”, as security insiders we knew that one unintended consequence would be a major cybersecurity stomach-ache. In four years, we have proven that yes, there is a need for a dedicated cybersecurity investment fund – and that the benefits of such specialization are even larger than we ever dreamed. ● Paul Ayers has joined us as an EIR based in London. Paul has an extensive background in bringing success to security companies in EMEA. Before joining Ten Eleven, Paul was General Manager of EMEA for Resilient Systems. There, he worked with Mark, who was serving on the company’s Board of Directors. Paul has also held senior positions at Vormetric and PGP Corporation (where he initially met Alex and Brian). Paul will be sourcing new deals in Europe and advising Ten Eleven portfolio companies on expanding into EMEA. ● Kaiti Delaney has joined us as an Associate in our Colorado office. Kaiti has held various financial and strategic positions in the technology, media and telecommunications space. Before joining Ten Eleven, Kaiti worked in corporate development at Level 3 Communications, helping to sell the company to CenturyLink. Prior to Level 3, Kaiti worked in investment banking at RBC Capital Markets and in Corporate Development and Investor Relations at Liberty Media. At Ten Eleven, Kaiti will be responsible for market sizing, new investment and portfolio company analysis, and assisting our early-stage companies with financial reporting implementation and best practices. With the addition of Paul and Kaiti, we are thrilled to have added new depth and capabilities to the growing Ten Eleven team. Ten Eleven Ventures has enjoyed tremendous success as the pioneering firm for cybersecurity venture capital. Over the past four years, we have validated our sector-focused, stage-agnostic investment strategy via three exits, an industry-changing, diverse portfolio and top quartile performance from our inaugural funds. With two new funds and a highly capable, five-person team in place, we are thrilled to begin the next chapter of our journey. We look forward to working together with our partners and community members during this exciting phase and to working with the next wave of industry-changing entrepreneurs to build thriving cybersecurity companies.